A new creative vision for the team achieving sustainable energy solutions, economic growth, and a reduction in global poverty. 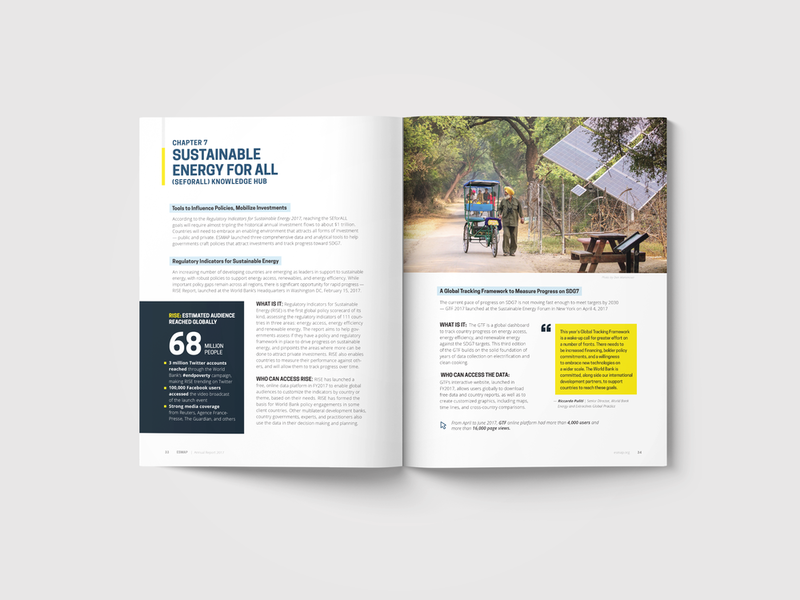 ESMAP is a collaboration between The World Bank and global partners that works to provide sustainable energy solutions in partnership with low and middle income nations worldwide. 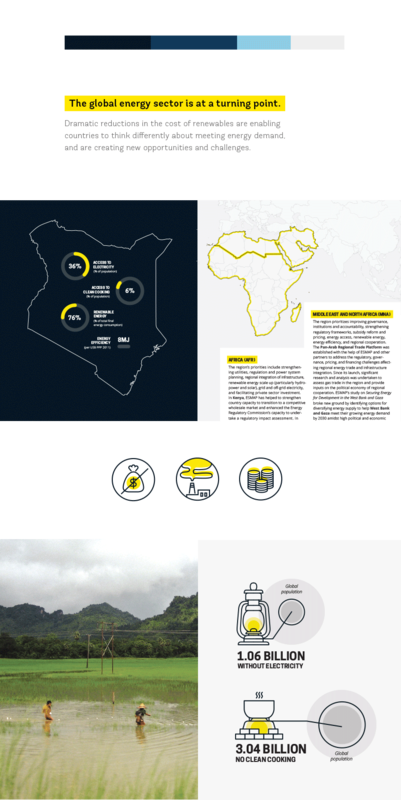 In developing a new brand strategy for ESMAP, we sought to create a versatile system of communication that is both deeply impactful and resonant with a diverse global audience. Additionally, we planned for key brand touchpoints to represent ESMAP both digitally and at international events. First, we strategized a brand. Looking to the established ESMAP logo's bright pop of color, we created a streamlined system of data visualizations and key messaging callouts through the use of a dark palette and bright highlights. 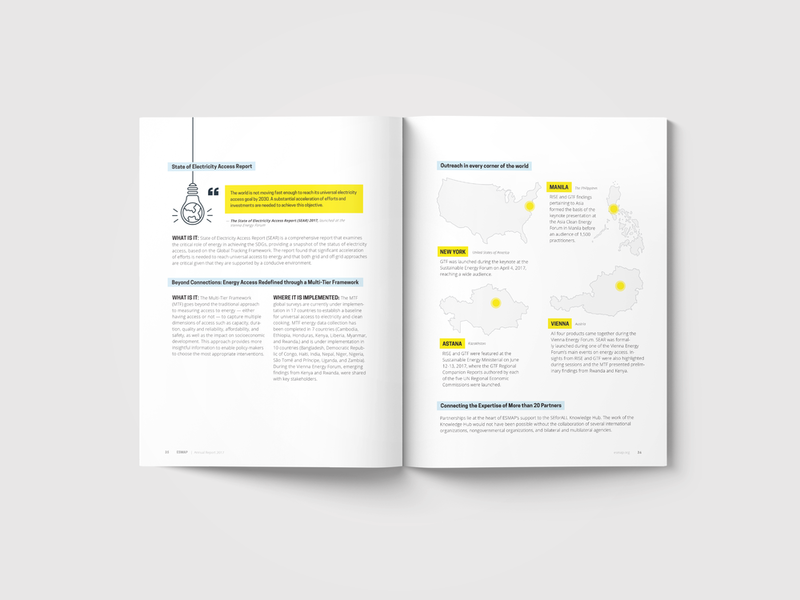 Icons are used as a wayfinding element to easily distinguish ESMAP's sectors at a glance, and graphic elements throughout accessibly illustrate both energy problems and energy solutions. 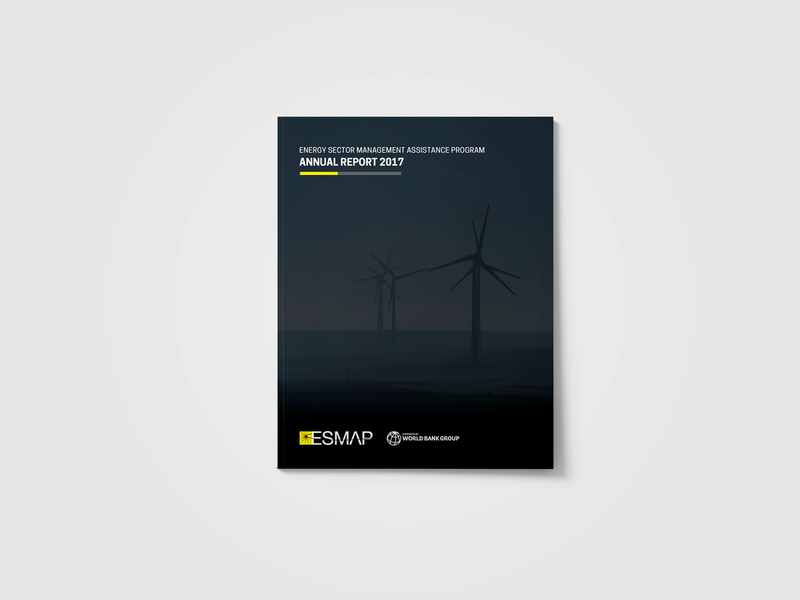 In brand application, we created a 2017 Annual Report and Program that were both printed and shared digitally, inspiring a complete revamp of ESMAP's online presence. Additional print collateral has been created for brand usage including print templates and Brand Guidelines to establish a consistent application of the new ESMAP brand through all collateral. ESMAP successfully debuted their new collateral and brand at the end of 2017 and continue to work with us to create additional creative touchpoints.